A rather long winded explanation as to why this project exists today, you may skip directly to Installing ahkab. 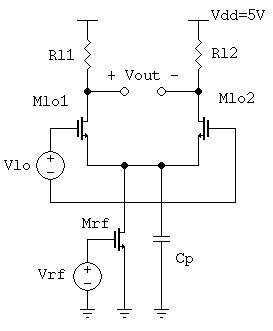 A young engineer begins to design a well-known, basic circuit block. He knows his stuff and he’s prepared: he did his homework on pen and paper first and now he wants to take care of schematic entry, checking that the circuit indeed works as expected, in case introducing slight adjustments as needed. He draws the circuit and, without even thinking about it, he clicks Simulate. The results are surprising to him, something he has not taken into account has influenced his simulation and the numbers are slightly off. Or maybe the schematic was drawn in a rush? He starts fiddling with the design parameters. Make some transistors bigger. Now, make a few others smaller. Shouldn’t this fix it? - he wonders. Maybe, but the aspect ratios that were just changed almost at random were initially selected to reach multiple results at the same time. If a fellow design engineer were to look at his screen now, he’d see a horrifying circuit: aspect ratios all over the place, cheap hacks to make up for the “secondary” parts that were removed in order to simplify the circuit, quantities that make no sense in the physical world. After going down the road of compulsive circuit simulation, little is left of the initial, promising design and our young engineer feels lost, frustrated and he’s metaphorically about to hitting his head against the keyboard of his workstation. Where’s the fun of doing circuit design this way? We have seen the above before... and that’s not how our beloved microelectronic work should be. Circuit simulators are just a tool. An insidious one at it, as we may naively use them instead of our gray matter, blindly trusting our models or giving in to the temptation of manual, broken “optimization” fiddling, rather than as a verification tool, area where they truly excel. It doesn’t help much that often neither it is straightforward to debug a simulation, nor it is clear what exactly the simulator is doing. The ahkab circuit simulator is an experiment. We have no expectation that our proof-of-concept, sometimes buggy, small circuit simulation tool will be replacing the mainstream circuit simulators: they are mainstream for good reasons and they very much deserve the praise and money we pay. It would be foolish to think otherwise. But we do still think we have our own place: what we wish to do with ahkab is to allow the user, the designer, to peek behind the veil and see more clearly what goes on with his simulations. For this reason, ahkab supports operations such as printing out all equation matrices. It is also written in a scripted, interpreted language (Python) that, while requiring us to sacrifice raw speed, should make it relatively easy to see what’s going on behind the hood. And the algorithms are there for you to see, inspect and, if need be, correct: too often scientific papers about software come with no available implementation or the source is not distributed: with ahkab all code is available under a copy-left license, allowing you to benefit of the code, modify it and giving others the same freedom. All in all, we hope this little project helps you understand better what will goes on in your circuit when you implement it, when you simulate it and especially we wish you have fun while doing so!